Max’s quest provides us with a disturbing glimpse of the human predicament at its most extreme. The lens Aronofsky uses focuses on our deep fear in the face of the eternal void, and on the equally deep need to create life jackets of meaning that keep us afloat amid the swirl of uncertainty. Pi allows us to see what happens when we put all of our apples in one cart; when we invest all of our money in a boat that leaks; and when we put all of our faith in something not meant to save us, only serve us. It shows us that by hanging on to anything with a white-knuckle grip actually causes one to lose their grip; but letting go enables one, paradoxically, to come to terms with what all humans struggle with and yearn for at the same time. 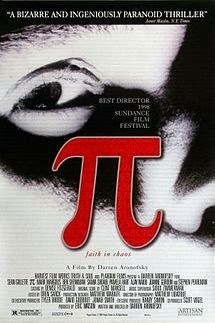 Human obsession, the concomitant strategies of denial, and the fear that underlies them, are the things Aronofsky consistently puts his cinematic finger on; and we can trace those concerns from Pi all the way to Noah. For example, in Aronofsky’s second feature, Requiem for a Dream (2000) not only do we find images and motifs carried over from Pi, but most importantly we see its protagonists (Jared Leto; Jennifer Connelly) blinded by fear, driven by empty promises, and bound by substances that serve as death dealing substitutes for life giving hopes and dreams. Though the film is unremittingly bleak, tracking as it does the main characters’ spiral into degradation and destruction, Requiem is far from nihilistic, but rather functions as a very sober, cautionary tale. In his third film, The Fountain (2006), Aronofsky engages us in a complex narrative involving 3 parallel times lines. Essentially, the main character (Hugh Jackman) is on an epochal quest to find a “cure” for death; and as the story unfolds we discover that the greatness of his drive is driven by an even greater fear of the very thing he can neither control nor achieve: the death of death. In the end, the protagonist finds that the attempt to erase death has made him its prisoner; and as he slowly comes to terms with his mortality, he discovers that the embrace of death is, paradoxically, the gateway to liberation and life. 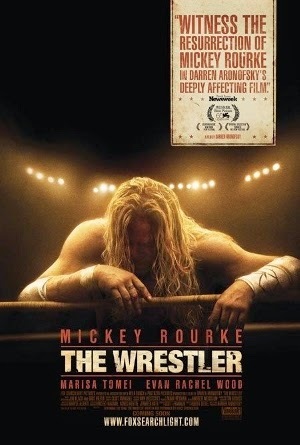 In The Wrestler (2008), Aronofsky’s fourth film, Mickey Rourke plays Randy “The Ram” Robinson, an aging, bruised and lonely wrestler who is trying desperately to make a “comeback”. While the cancerous holes in that dream are realities he can no longer deny, this is all Randy knows. He is a wrestler. After suffering a life-threatening heart attack, he is ordered by his doctors to quit wrestling or die; but when he is offered a deal to wrestle his long time nemesis in a rematch that promises a hefty purse and a chance to reclaim lost glory, he agrees to fight “one last time.” During that final match we watch as Randy’s heart begins to fail him. But at the roaring behest of his fans, the faltering Randy performs a move made famous by him, the difficulty of which will surely kill him. We then see him climb atop the ropes, and with outstretched arms laden with symbolism, he leaps into the air and out of Aronofsky’s frame. Aronofsky’s fifth film, The Black Swan (2010) is about performance and the quest for perfection that many consider to be a companion piece to The Wrestler. But while both films depict the obsessive pursuit of a career at the expense of all else, as well as the collapse of the performer/person distinction, The Black Swan highlights the toxic and psychologically incestuous relationship between the mother, Erica (Barbara Hershey) and daughter, Nina (Natalie Portman) as the likely locus of the latter’s pathology. Obsessed with shaping her daughter into the ideal image she herself never attained, Erica has succeeded in creating a near perfect dancer, but in the process, Nina has been robbed of her ability to authentically connect with herself and others. As tension mounts, the relationship between the ideal and real becomes increasingly blurred; and in the bravura final act of the ballet, when Nina ascends the stairs toward the light and then plummets to the darkness below, we witness a sacrificial gesture of profound pathological proportions. 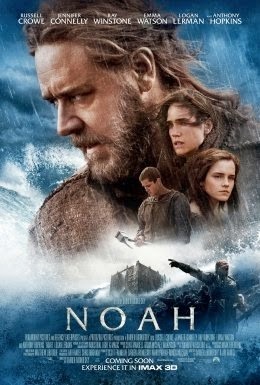 Aronofsky’s sixth and most recent film is Noah (2014). While Aronofsky necessarily reads between the lines of the biblical account, his efforts here, on my reading, are interpretive rather than transgressive. Rather than a bit of pagan propaganda designed to lead the faithful astray, as some claim, for all the liberties taken, the film is quite respectful of and faithful to the spirit of the narrative. Moreover, in the face of the film’s artistic flourish and visual indulgences, the simple point being made is that Noah (Russell Crowe) is a good, even righteous man, but also a flawed man. Significantly, rather than having a direct pipeline to God, this more human Noah hears from God indirectly through his dreams, and this makes all the difference. While it’s true that, in the beginning, Noah is convinced he knows what God’s intentions are, and one might say righteously obsessed with carrying out those plans, when pushed to the existential limit, in the end, Noah finds a more humane and sober faith. On my reading, at least, what all of Aronofsky’s films highlight are the Promethean, fear-based penchants that drive us and the obsessions that often devour us, demanding as they do our very souls. But in the face of evil and the excesses that threaten to swallow every moment in death dealing impossibility, Aronofsky shows us that each of those moments are simultaneously primed with life giving possibility.